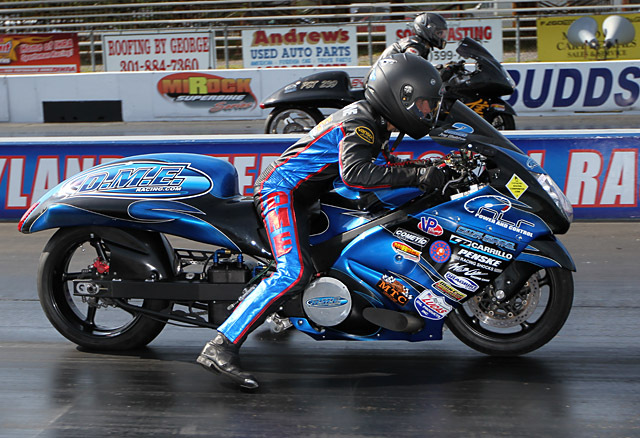 The full-on Mickey Thompson MIRock Superbike Series returns to action July 19-21 for the world’s biggest motorcycle drag racing, bike club, stunt, music, culture and lifestyle event—the WPGC Bike Fest at Maryland International Raceway in Budd’s Creek. This is the one, the only, can’t miss event on the bikers’ calendar—featuring the world’s quickest streetbikes, the DC area’s best bands and bikini models, beer tent with bikini bartenders, and giant manufacturers’ midway. Dimey Eddinger’s DME Racing Team, with riders Joey Gladstone, Terrence Angela of Aruba, and Greg Wallace, will continue their assault on the Orient Express Pro Street class at the home of the world’s first 6 second streetbike pass. But despite having to ride multiple bikes so far in 2013, three-time champ Rodney Williford is right there—aiming for the class’s first 6.80 and his fourth straight title. 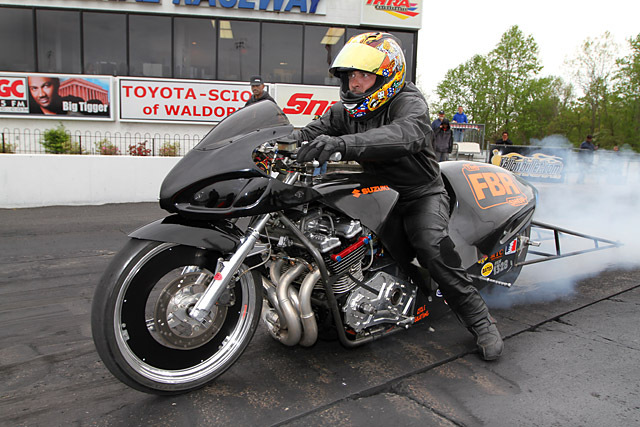 The Bike Fest always draws an extra large field from all over, so expect the potent Michigan combination of builder/tuner Ronnie Mitchell and rider Bud Yoder, Rockingham winner Doug Gall, Tony Ficher’s screaming, supercharged Suzuki Hayabusa and more. All will be dreaming of MIR’s $10,000 Pro Street “Battle Royale” coming up in October. The ongoing battle between reigning DME Real Street champ Johnny “Turbo” Dobrin and his Exoticycle turbo ‘Busa vs. multi-time champ Jeremy Teasley and his Roger Starrette owned and tuned, nitrous-huffing Kawasaki ZX14 will take center stage throughout the weekend. Neither of these two give quarter on any pass, shooting for both ends of the record every time down the MIR quarter mile. 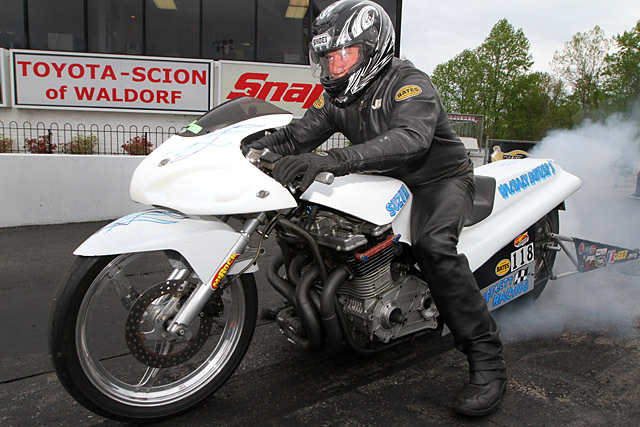 The world’s quickest index bikes take on the Louis Concrete 4.60 eighth mile challenge. Winners so far this year are Jeremy Teasley on the HTP Performance ADRL PXM Hayabusa, Ronnie Smith, and two-time Rockingham winner Kenny Cornell. 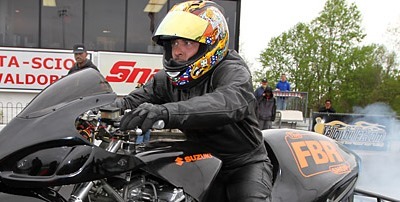 With less than half the season complete, Trac King/APE Top Sportsman features an all-out points battle between leader Julie Lucas, Brian Canoles, “Fearsome” Andy Baumbach, reigning champ Boo Brown, Chris Clontz and Mark Schwalm. Teasley’s not just leading the DME Real Street fight, he’s also leading MIRock Crazy 8s. Travis Boudreaux and Bob Carlson are tied for second, with Jordan “By the Fire” McDougald lurking in fourth and MIR homeboy Shayne Proctor in fifth. Class sponsor Marion Ford leads his own FBR Shop 5.60, followed by Michael Herman Jr. and Robert Parker on their streetbikes, and Willie Jones and Curtis Griggs Jr. on dragbikes. Herman and his dad Mike Sr. are already qualified for November’s Fast by Gast Pro ET tournament of champions at Rockingham, along with reigning champ Dale Hamilton, Glenn Glass, Terry “T-Bone” Singleton, “Hillbilly Hustler” Jimmy Shifflett, Jerry Turner and Ben Knight. Any name not on this list will be looking to join it. Same goes for Brock’s Performance Street ET. Reigning champ Boo Brown is already in, along with Carlson, Knight, Proctor, both Hermans, Mike Schultz, Wayne Smith, Jimmie Miller and Dustin Lee. Saturday night’s Afterdark Undergound and grudge sessions throughout the weekend will feature the world’s quickest, clandestine, “No Time” bikes and the Big Time Hustlers and Trash Talkers that follow them. Look for Derek Henderson’s RG3, Slimm’s no-name 1000, Ric Flair, Cobra Commander, Eddie Kane and all the big names shakin’ down and layin’ Benjamins on the line. The “Paint The 1/4 Pink” program will once again be run at the Bike Fest to raise money for “Bikers Against Breast Cancer.” This program is for female riders only, competing on dragbikes and streetbikes. The 32-bike qualified field will run on Saturday and will run in an ET bracket racing format. These female motorcycle racers have been raising money from sponsors and taking donations for this great cause, so come on out and show them your support. The DC area’s absolute hottest bikini models will be strutting on the MIR stage, MC’d and egged on by WPGC personality DJ Flexx. Also rocking the stage will be R&B superstar Reesa Renee. But that’s not all. The Cycles of Silver Spring East Coast Stunt Jam will rip up the tarmac while the blindingly glossy custom bike show will have everyone shading their eyes from all the bling. The huge vendor midway will offer motorcyclists parts and services they just can’t get anywhere else, while bikini bartenders and a vast array of food, beverage and treat vendors keep everyone’s thirst and hunger satisfied. Can you imagine having to stare at the calendar waiting for next year if you miss the WPGC Bike Fest? You will be depressed and no one will want to be around you. Don’t be depressed and friendless, come to MIR’s WPGC Bike Fest.